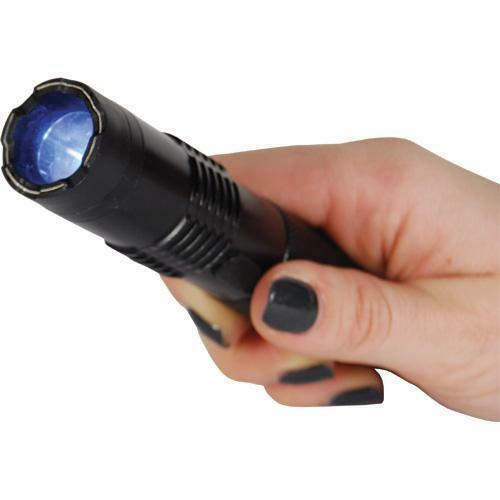 The BashLite 15,000,000 volt Stun Gun Flashlight has a sleek durable design. It is made from high quality aircraft grade aluminum. The BashLite will strike with 4.7 milliamps of stun power. The knockout punch of the stun gun will take an attacker down very quickly leaving them in pain and on the ground. The super bright 120 lumen light can be used tactically and shined in the eyes of an attacker to temporarily blind them. It comes with a wrist strap lanyard and has an on/off safety switch. The sleek design is perfect so it can fit easily in a pocket, side door of a car, or in your hand ready to strike. It measures 5 13/16" x 1", comes with a wall charging cord and nylon holster.